Welcome to day 4 of MFT Teasers. 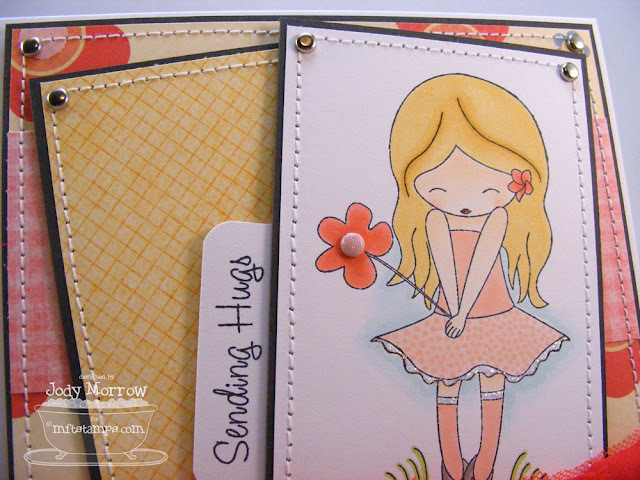 Today, we are featuring 2 stamp sets and I have a card using each one. First up we have Jolinne - Just For You. I used the negative portion of the die-cut piece and used it as a frame. I stamped the matching Frame image inside using white pigment ink. 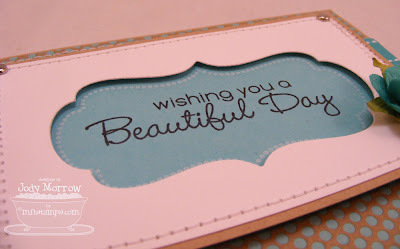 I added one of the sentiments in the set: wishing you a Beautiful Day. I added just a couple brads, ribbon element and Prima flower to finish it off. 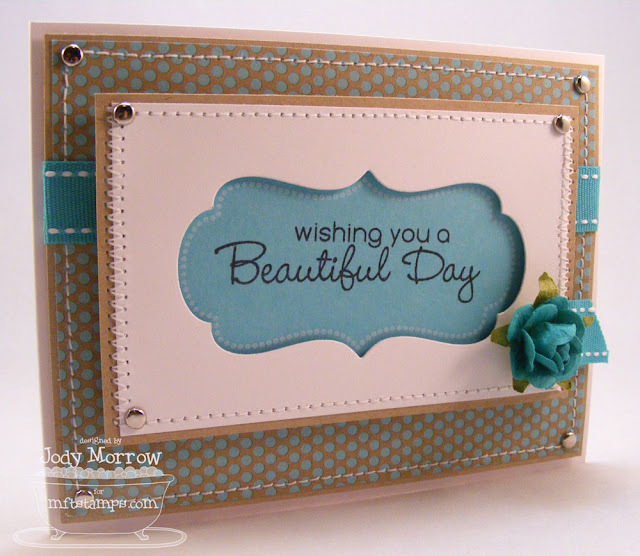 See you tomorrow for more teasers and the blog hop! Fantastic, Jody! Love the bits of glitter on the first card and the negative frame is awesome on your second! Can't wait for the release~! adore your Joliene card-soft and pretty, just how she should be. And swoooon! for the framed greetings-LOVE it. looks great with the dotty biscotti! Very sweet card!! Love it! These are GORGEOUS Jody!!! LOVE both of these! The flower ribbon is DELIGHTFUL and I ADORE your Framed Greetings card! The way you did the die is genius! Can I be you???? Gorgeous Jody!! Love them both!!! 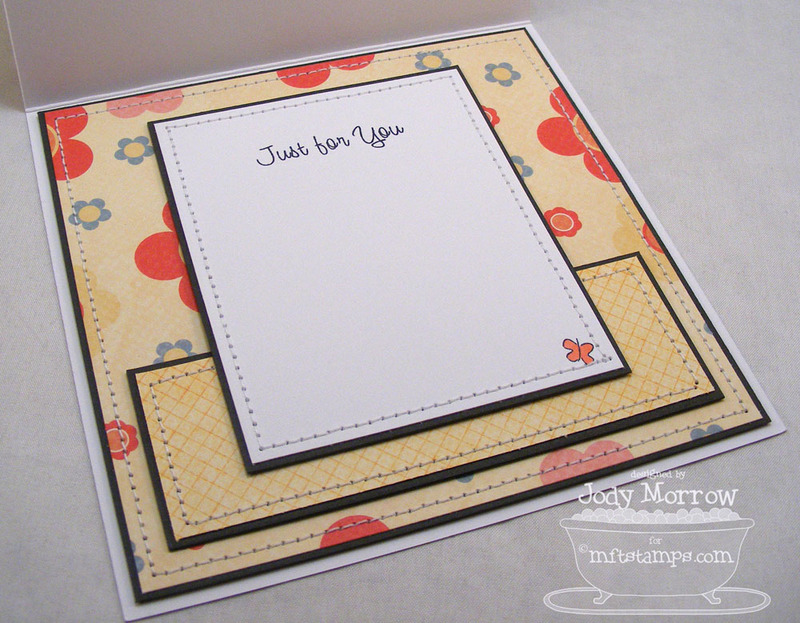 Lovin' that big ruffle border on your Jolinne card....so sweet! Both gorgeous, Jody. Especially love the cut out for Framed Greetings. Great cards! I love how you used the Framed Greetings! Just gorgeous Jody! Love the papers and the flowers on Jolinne! The Framed Greetings card is just brilliant! Love that you used the negative from the die! Love them both, Jody (but especially the first). So soft and pretty! love the brads holding the corners down! nice touch! Jody, Both of the cards are very very cool. I love the top one the most. Cause of the color's you use. It's been a long time since I've stopped by to see what you have been up too.